Savings bonds, once a favorite offering at banks and credit unions, allow you to lend money to the U.S. government. They are securities issued by the U.S. Treasury Department that provide funding dollars for government operations, and the government pays interest in return for using your money. Those instruments are still available, but they’ve evolved. You can buy savings bonds online or with your tax refund, and you can still hand out paper Series I bonds as gifts. However, the process is harder than it used to be. Interest rates depend on general economic conditions. As interest rates in the broad economy rise, so do the interest rates paid on savings bonds. The U.S. Treasury Department’s website lists current and historical rates. Rates on savings bonds are roughly in line with interest rates on other safe savings vehicles, such as FDIC-insured bank accounts. Savings bonds are backed by the full faith and credit of the U.S. government, making the default risk on savings bonds relatively low. You can probably earn more at an FDIC-insured online bank account, but savings bonds may provide tax benefits in some cases to help enhance your returns. Depending on your situation, you may receive tax benefits from using savings bonds. Deferral: You may be able to wait until the bond matures or you take certain actions to claim interest income on bonds. Ultimately, you might be able to delay claiming the interest income until you redeem the bonds or give up ownership and have bonds reissued (or until they mature, which is typically 30 years after issue). If you don’t want to claim income now, but you wouldn’t mind claiming it later, savings bonds might help. Education expenses: Another potential benefit is the Education Tax Exclusion (or Education Savings Bond Program). If you cash in your bonds and use them for qualified higher education expenses, you may be able to exclude that income from taxes. Be sure to follow the rules regarding the type of expenses, income limits, and more that are detailed at the Savings Bond for Education site. State and local taxes: Savings bond interest income may be ​exempt from state and local income taxes. As a result, you potentially can spend more of what you earn. Depending on your state, this can be a big deal or almost insignificant. Verify before claiming: Taxes can be complicated, and the rules change periodically. Speak with a professional tax preparer about your particular situation, your goals, and current laws before you buy or redeem savings bonds. Most importantly, don’t file your taxes without verifying that you’re following all IRS rules. You must wait at least 12 months to redeem bonds, so they may not be appropriate for emergency savings. If you cash out within the first five years, you lose the last three months’ interest. Because they’re relatively safe, savings bonds don’t offer huge returns. As a result, you risk losing value after inflation, so savings bonds may be best for situations when you simply can’t afford any risk to principal. If you have a long time until you’ll use the money, it may make sense to at least investigate other options. 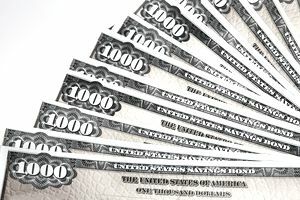 Series I savings bonds include a hedge against inflation. You earn a modest fixed rate plus an inflation-adjusted rate. During periods of high inflation, you earn more. When inflation is low, you earn less. Traditionally, you could buy U.S. Savings Bonds at banks and credit unions, but that option ended in 2012. The U.S. Treasury only allows U.S. savings bond purchases online or as part of your tax refund. You still can redeem paper savings bonds at most financial institutions. Create an account. Start by providing standard personal information such as your Social Security Number and date of birth. You also need to set up security questions and answers much like at any other financial website. Set up funding: Link a bank account to your TreasuryDirect account to fund your savings bond purchases. When you redeem bonds, funds can move directly to your bank account. Buy bonds: Once you’re up and running, you’re ready to purchase bonds. Savings bonds commonly are given as gifts, and you still can purchase bonds for somebody else whether you buy online or with your tax return. To buy a bond as a gift, use your own TreasuryDirect account, and the recipient needs her own account to receive the gift. If the recipient is younger than 18, the child's parent or guardian needs to open an account as well (and then open a "Minor Linked Account"). In addition, you'll need the recipient's Social Security number when you buy the savings bond. If the child's parents can't or won't open a TreasuryDirect account, you still can purchase the bonds, hold them in your own account's "Gift Box," and transfer them at a later date. Because of these limitations, buying bonds with a tax refund might be a better option if the intent is to give the bonds as a gift. In addition to buying at TreasuryDirect, you also can buy Series I U.S. savings bonds with your tax refund. Use Form 8888 to purchase bonds with a portion of your refund. You must buy in $50 increments, and you can get up to $5,000 in bonds at one time. When you use your tax refund, you can buy Series I savings bonds in paper form. You also can have the bonds issued in somebody else’s name if you want to give them as a gift. If you receive paper bonds or give them as gifts, owners can redeem the bonds at banks and credit unions. Alternatively, you can exchange paper bonds for electronic bonds in your TreasuryDirect account. TreasuryDirect provides an online tool that allows you to input the type of bond you own, when it was purchased, and the purchase amount. From this, you can determine the interest rate, how much the bond has earned, how much it will earn in the future, and its maturity date. This is a valuable tool to use when considering cashing in savings bonds so you can redeem them when you are getting the most value in return. Most bonds purchased since May 1997 add interest on a monthly basis, while most bonds purchased before May 1997 add interest every six months. The key to getting the most value is redeeming them right after interest has been added. You don't want to lose money by redeeming the bonds just before the monthly or semi-annual date when interest will increase their value. If applicable to your own situation, it's also helpful to redeem the bonds when you are paying for qualified education expenses because the Education Tax Exclusion program allows you to deduct those expenses from your income, effectively rendering the income from the bonds tax-free.